We analyze how four leading industrials organizations overcame these challenges and provide case studies for each. Our overall findings reveal that connecting commercial data, people and sales efforts was critical to each company’s ability to capture more share of their customers’ wallets. In recent years, many industrial companies have expanded their product and service offerings, through both organic and M&A efforts. Companies within subsectors such as industrial equipment and engineered products, distribution, packaging, agricultural equipment, and logistics are especially keen to take advantage of crossselling and solution-selling opportunities. However, even with a broader portfolio of products and services, many industrial organizations are still struggling to capture greater share of their customers’ wallets. While it is easy to assume a broader product and service offering will naturally lead to higher sales, in practice this is often not the case. L.E.K. Consulting’s research has uncovered four key sales challenges that industrial companies face when it comes to increasing their share of customers’ wallets, along with four examples of how some leading organizations have overcome them. What do all four have in common? They have connected their commercial data, people and sales efforts to routinely uncover customer insights and execute against them. Industrial companies increasingly find themselves swimming in data — data about customers, products, services and more. Often the problem is that the data isn’t available in a single, centralized source that can be mined for actionable insights. Rather, it’s stored across internal sources, such as in the customer relationship management (CRM) and enterprise resource planning (ERP) systems and with customer service, as well as across external sources, for example in industry research, on the web and in social networks (see Figure 1). And with the rise of the Industrial Internet of Things, that volume of information will only grow. Results. Companies are unable to harness sales insights from the vast amounts of data in order to identify customer-specific crossselling and solution-selling opportunities. EMC, a provider of enterprise IT infrastructure solutions and now owned by Dell, wanted to increase its market share in underpenetrated markets and accounts. But after acquiring more than 80 companies over the previous decade, it found itself with multiple siloed data stores and no coordinated approach to customer data management. As a result, it was unable to fully exploit the data’s potential for use in targeted marketing and lead generation campaigns. Solutions. The company consolidated multiple siloed “islands” of data into a single stream. The stream ingests structured data from customer information (such as past purchases), demographics and marketing history, as well as unstructured data from sensors, social networks and the web. It provides a 360-degree view of customers, which can be leveraged for targeting, planning, reporting, lead management and campaign management. Since its sales and marketing team did not have the right analytical and statistical skill set to deploy the new data sets and additional tools, EMC created a team of data scientists, data analysts and data engineers to assist them. The firm also developed and launched an in-house training program dubbed “Addictive Analytics” to teach marketers and other non-analytics-focused employees how to leverage analytics in their day-to-day work. Results. EMC now uses the wide-ranging and diverse data set to predict customer behavior with greater accuracy and, in the process, enable greater cross-selling. The company is also able to better target the right customers for cross-selling — and to allocate sales efforts accordingly. And it’s using the data to develop additional tools aimed at improving the customer experience overall. In the meantime, data query timelines have been reduced from four hours to less than a minute. 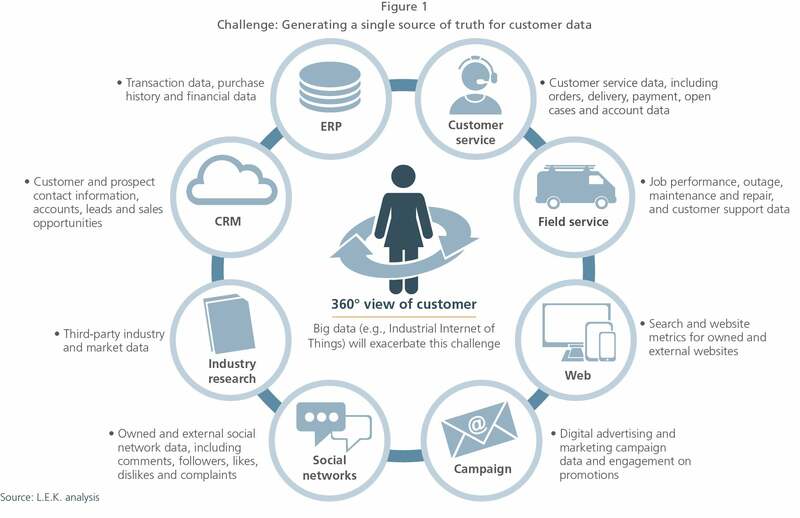 Consolidate customer data into a single source of truth. Sales teams need access to data insights that may otherwise go unnoticed by those in other departments. Companies need to give their sales teams full access to all customer data and ensure they have the ability — or necessary support — to effectively analyze the information. Build technical capabilities into the sales and marketing organization. Leading companies are creating new roles, such as data scientists and marketing technologists, to bridge the gap between marketing and business intelligence/IT. They are also pushing front-line sellers to become sophisticated data users in order to reduce the influence of old-fashioned gut instinct in driving the decisions of sales teams. Invest in the right tools and systems. Leading companies are supplementing their CRM systems with predictive analytics tools. Incentivize marketing teams in order to drive close collaboration with sales. Similar to sales teams being rewarded for closing deals, marketing teams’ compensation is increasingly being tied to the impact and results of their business goal activities. When it comes to analyzing data, especially data deeply focused on customers and necessary for generating potential sales leads, individual teams — from product development all the way to marketing — tend to be focused on their own area of expertise as opposed to taking a holistic view of the organization. Moreover, sometimes the analytics skill sets of such teams aren’t needed to generate the kinds of insights that can lead to cross-selling and solution selling. Results. Teams with disparate responsibilities and focus areas can lead to an analytics capability gap, resulting in missed opportunities for identifying customer insights and offering tailored solutions. GE Oil & Gas is a subsidiary of the energy giant that is now part of Baker Hughes. Like the rest of GE, its customer data was spread out across various teams throughout the organization, making it difficult to generate customer insights leading to sales opportunities, as each team was focusing its analytics capabilities solely on its own area of responsibility. In the meantime, GE had added more technology-based solutions to its offerings, so its transactional approach to sales within the oil and gas market needed to be revamped. Solutions. GE, working with leaders representing teams in sales, digital technology (IT), commercial excellence and marketing, took 2.5 million disparate customer accounts and put them into 350,000 clean commercial entity structures. Once the actionable data insights needed to identify customer insights and offering tailored solutions were at the fingertips of GE O&G’s sales teams, it then set about training the entire organization to adopt a more solution-focused approach. GE O&G also realized that with its move to software-heavy solutions, it needed to change who its salespeople were engaging with at the customer company. Rather than the VP of operations or engineering, it directed its sales teams — now armed with the analytics capabilities they needed — to engage with the buyer’s CIO and/or CTO. Results. GE now expects to deliver new market insights that enable 5% growth, or $25 billion, by 2020, while it enables its sales teams to serve customers 50% faster — which translates into roughly $30 million in productivity. Identify analytics capability pockets and bring them together. Companies can systematically identify where in their organizations there are analytical responsibilities and strengths to leverage and connect them — data, people and processes — to ensure alignment exists and a more holistic view is then taken. Implement tools and techniques that support solution selling. Companies need to give employees more than just access to data; they need to give them tools and techniques to effectively leverage it. Organizational changes, such as bringing in new talent with an analytical skill set and mandating ongoing training sessions, may be required to ensure their adoption. When selling digitally focused solutions, engage with digitally focused customer representatives. Companies selling digital solutions need to be engaging with like-minded executives on the buyer side. Solving a customer’s problem typically requires in-depth knowledge and technical expertise of the underlying issues. 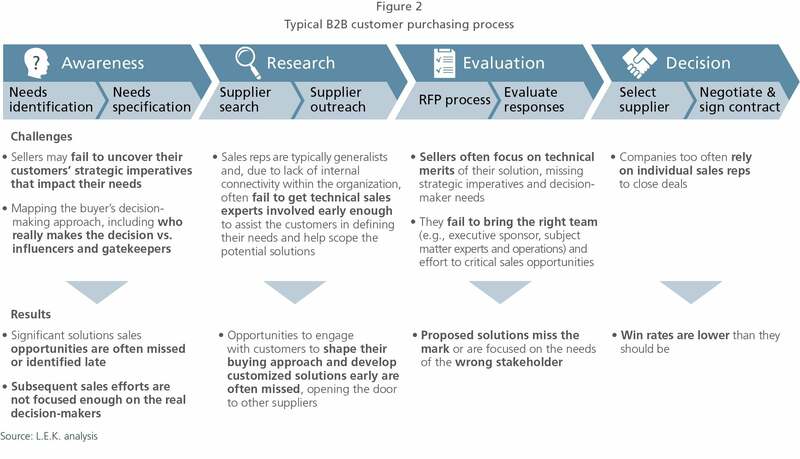 But many sales reps are generalists and prefer to work on their own unless absolutely necessary, in the process neglecting to get technical sales experts involved early enough to properly define the customer’s challenges and help scope the potential solutions (see Figure 2). At the same time, sellers may fail to uncover the strategic imperatives that impact the customer’s needs or to map their decision-making approach — including distinguishing between the influencers and/or gatekeepers and the true decision-makers. Results. Time is lost, problems are ill-defined, proposed solutions are off-point, customers get frustrated and win rates are lower than they should be. After several years of strong performance, a leading industrial services provider experienced a flattening of its growth trajectory. The flattening took place across the sales organization — all except for one rep, the top performer in the firm. Solutions. Upon closer inspection, it became clear why this one rep was outperforming his peers. In-depth analysis and interviews revealed that he spent far more time early on in his discussions with the customer to learn its strategy and key priorities, what it was struggling with, and any constraints it had. He also pulled in technical solutions support from his own organization in order to glean a deeper understanding of the customer’s underlying issues. And he mapped out the customer’s purchase decision-making approach as he networked with people in the business, procurement and other stakeholders, which gave him critical insights into how the customer was likely to make its decision. Armed with these insights, he was then able to define a high-level solution that a key customer executive aligned with, leading to a multiyear contract that was unprecedented in his company for its size and solution scope. Train sales reps in how to identify the client’s broader strategic needs and its decision-makers as well as the solutions the company has in place to serve them both. To enable solution selling to customers, sales reps need to have a deep understanding of their client’s business challenges and desired outcomes as well as know who the key decisionmakers are and the products and services that make up the solution. Involve technical experts. Companies need to put in place defined processes in order to involve technical experts at the right time during the sales process. 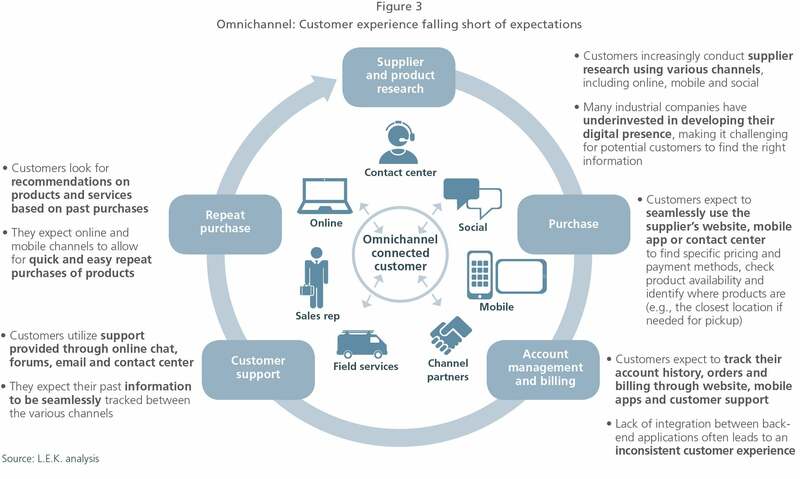 B2B customers, who have grown used to the seamless omnichannel retail experience spearheaded by Amazon, have come to expect it in every purchasing environment (see Figure 3). But many industrial companies have underinvested in developing their digital presence, making it challenging for potential customers to find the information they need or to connect with the people who can help them. And instead of having their account and ordering information linked among a supplier’s various channels, a lack of integration between back-end applications and customer data often means existing customers have trouble transacting across those channels. Meanwhile, sales and service people miss crucial opportunities that connecting integrated information across customer channels would provide for proactively upselling and cross-selling. Results. Prospects get turned off early in the sales process, and frustrated customers look to other suppliers who will make it easy for them. Grainger, a supplier of maintenance, repair and operating products, wanted to better facilitate the purchasing abilities of its customers, who often place orders via their phones while out on job sites. It was particularly important to purchasing managers to get workflow approval on the spot and to easily view their purchasing history in order to not lose valuable time while out in the field. Solutions. The company integrated its back-end systems to allow customers to see specific pricing and payment methods as well as check product availability (including, if applicable, brick-and-mortar pick-up locations). It also seamlessly integrated the Grainger mobile app and Grainger.com ecommerce platform, both of which feature a single-page checkout that displays the customer’s account information, including the payment method, shipping address and default branch, along with an easily viewable six-month history of ordered items to enable repeat purchases. Grainger ensured that many products in the mobile app were pre-authorized for purchase. The app also enables personnel\ out in the field to send more specific purchasing information to a manager with purchasing authority if they don’t have it themselves. Using Grainger’s order management system, customers can set up their own approval workflow, which identifies who can approve an order request and at what dollar amount. Integrated workflow management features allow multiple customer staff members to accept, reject or forward purchase requests made in the field. The company provides automated tours of its mobile app functionality to help customers quickly understand how to use its features. And customers can chat with a Grainger expert online to quickly answer questions about products and any other needs they may have. Results. Customers now get a true omnichannel experience, one that is accessible 24/7 from the device of their choice and seamlessly integrates real-time Grainger product information with their own profile, ordering history and a purchasing process complete with approval-workflow capabilities. Enable customers to engage with/purchase in the way that is most convenient for them (e.g., phone, online, mobile, in person, etc.). Companies need to make purchasing available through every channel while paying special attention to the most common purchasing environment of their customers. If the majority of them are ordering from out in the field, for example, a powerful mobile app that minimizes the steps to checkout will be especially important. Ensure ecommerce or mobile platforms are fully integrated with back-office systems. Providing buyers with access to real-time inventory information avoids shipment delay. Giving them a way to easily see their ordering history, including related purchasing terms, significantly streamlines the purchasing process. Provide a consistent, personalized experience across each platform. Customer interactions with the seller should be consistent across each platform; in addition to consistent messaging, customers should have access to the same terms and product/service offerings. Deliver a user-friendly experience. Ecommerce and mobile sites should have a clean, visually appealing layout. Products should be arranged into well-defined categories that make it easy for buyers to search for and view products. While many industrial companies have expanded their product and service offerings in recent years, they’re still struggling to capture greater share of their customers’ wallets through crossselling and solution selling. To create those selling opportunities, industrial companies need to take a connected approach to their data, their people and their sales processes. By seamlessly connecting those three critical components across their organizations, they will be able to create a 360-degree view of each of their customers, centralize the analytics capabilities of their various teams, lessen their reliance on individual sales representatives and provide their customers with a genuine omnichannel purchasing experience — all of which will lead to greater cross-selling and solution selling and, in turn, to increasing their share of customers’ wallets.